Many of my clients experience a lot of stress at work which leads to feeling burned out and less satisfied with their job. Many of these clients are in the “helping field” whether they are nurses, doctors, child life specialists, social workers, police officers, nannies, firefighters, military, veterinarians, human resources, ministers, teachers, physical and occupational therapists, or maybe even a counselor like myself, just to name a few. While many clients I work with outside of the helping field also become stressed out in their careers (which can lead to anxiety and depression), compassion fatigue is a different type of experience due to the type of work those in the helping field take on daily. These individuals are essentially doing emotional lifting each and every day while they work. 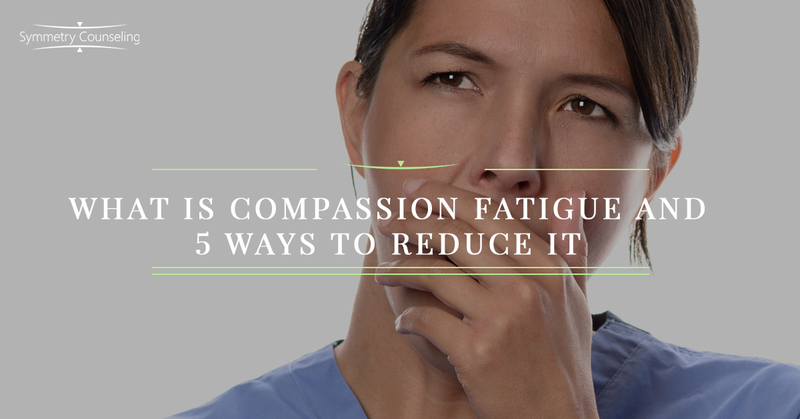 So what can individuals do to reduce compassion fatigue? Below is a simple guide. Boundaries. It can be very easy to lose sight of boundaries because you care about the clients you work with. However, not having boundaries, specifically emotional boundaries, can lead you down a slippery slope into compassion fatigue. Leave work at work and turn off your email, unless there is an extreme situation regarding client safety. Processing/Journaling. You might feel the need to “be strong” for your client, but as soon as you leave work, you experience an overwhelming flood of emotions, likely due to feeling a strong sense of empathy. Attempt to process these feelings through journaling, writing how these feelings could be triggers in your own personal life. Self-Care. It is so incredibly important to make time for yourself each and every day, whether it is through working out, getting your nails done, meditation, or watching a movie. Making sure to carve out that time each day can certainly help reduce compassion fatigue. Support System Time. Spending quality time with your friends, family, or significant other is also very important. Through doing this, you are allowing yourself to talk to others who care about you and who realize you may have heard or witnessed trauma secondhand. Keeping these work experiences locked inside can also be a slippery slope that leads to compassion fatigue. Vacation. Yes, you too deserve to have a vacation! You may think, “But what will happen to my clients if I take time off?” While that shows you are incredibly compassionate, it is important to remind yourself that not only do you deserve a vacation, but doing so will also help you recharge your batteries and be an even better professional in your field. While this list provides a variety of ways to reduce compassion fatigue, try to focus on the one(s) that you think will help you the most as you truly know you more than anyone else. Once you identify what works best, try to be consistent with it. If you are currently struggling with compassion fatigue, it may be a good idea to connect with one of our skilled counselors at Symmetry Counseling today. You can contact them at 312-578-9990 to set up an appointment.